Today, more than 90 percent of online experiences start with search engines. Whether you’re trying to find a new restaurant, buy running shoes, or lookup showtimes for a movie, you probably start your search on Google. When people search keywords and phrases related to your business, you want to appear at the top of search engine results pages (SERPs). To rank at the top, you need quality, SEO-optimized content. But how do you write for SEO? In this post, we’ll outline eight search engine optimization (SEO) writing tips to help you rank at the top of the SERPs and convert more leads. What is SEO writing and why is it important? How is writing for SEO different from traditional copywriting? SEO writing combines content creation and SEO strategies to produce content that ranks at the top of SERPs and adds value for readers. Let’s unpack the term a bit more. And…you guessed it — content creation (writing for SEO)! Without fresh, quality content, search engines have nothing to rank in search results. SEO writing is crucial if you want to earn top rankings for search results related to your business. Ultimately, higher rankings allow you to earn more traffic, leads, and revenue — and obtaining top rankings is a huge win for your business. Wondering how to write SEO copy for your site? Take a look at these eight tips. SEO writing takes time and practice to master, but we put together a list of SEO content writing tips to help you get started. Here’s how to do SEO writing in eight easy steps. Successful SEO writing starts with keyword research. In order to determine the most relevant topics for your business, you need to conduct keyword research using tools like Ubersuggest and Keyword Tool. Entering this phrase reveals numerous topics related to flower arrangements that could inspire site content and blog posts. Keyword research unveils valuable SEO writing topics. When creating SEO content, it’s important to include target keywords in key places like your page titles, meta descriptions, headings, and site content. Just remember — you don’t want to stuff your content with keywords. Keyword stuffing was a popular SEO technique for boosting rankings in the past. However, keyword-stuffed content doesn’t provide an authentic experience for site visitors, and search engines no longer rank content purely based on the number of times a phrase appears in the copy. Instead of stuffing your piece with keywords, consider adding keyword variations and related keywords. Related keywords help search engines understand the meaning of your content, and tools like LSIGraph help you generate related keywords for your SEO writing. Next, you’ll want to write SEO content that matches search intent. This concept often confuses copywriters, so let’s talk about it more in-depth. When people search keywords or phrases on Google, the intent of the search isn’t always clear. For example, if someone searches “running shoes,” they might want to buy new running shoes — a purchase intent. However, they could also be researching various brands of running shoes. Informational: Searching to learn about a subject or topic. Navigational: Searching a specific brand or website. Transactional: Searching with the intent to purchase. Commercial: Searching for information to choose and purchase the right product. With generic keywords, like “running shoes,” it’s tough to distinguish search intent. On the other hand, if someone searches a long-tail keyword like “buy women’s nike running shoes,” it’s easier to identify what they want to find. While long-tail, more specific keywords often have lower monthly search volumes, they have less competition. This means it’s usually easier to rank for long-tail keywords, and you can more easily write SEO content that matches search intent. Why is search intent matching so important? Search engines want to display results that match searchers’ queries. So, if you’re going to rank at the top of the SERPs, you need to consider search intent for keywords related to your business. If you’re trying to decipher the intent behind a search, start by looking at the content that already ranks in search results. Let’s go back to the florist example. A quick Google search for “flower arrangement” reveals these top three organic results (below the paid results and local SEO 3-pack). 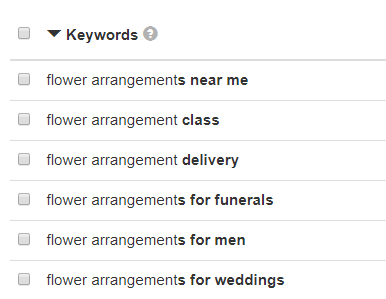 Clicking on these results gives searchers the option to purchase flower arrangements for various occasions. 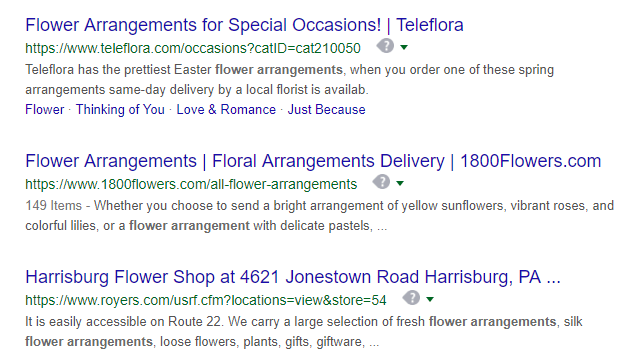 We also see a local search intent with the “Harrisburg Flower Shop” result. From this content, we can deduce that people searching “flower arrangement” most likely want to purchase an arrangement. In this case, a DIY blog post about creating arrangements would likely not rank at the top of results. 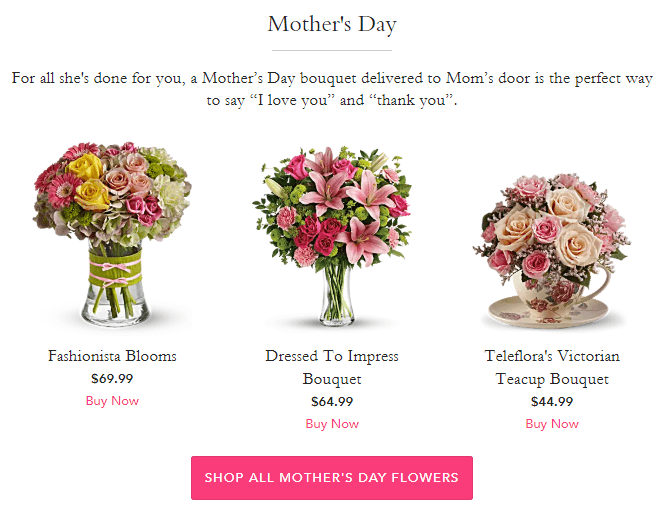 Instead, florists might consider writing SEO content that highlights their arrangement offerings and prices with call-to-action (CTA) buttons to purchase. While SEO content often focuses on earning top rankings in search results, you’ll also want to write content that’s engaging and easy for readers to digest. Make sure your content flows naturally. Just because you’re writing for SEO doesn’t mean your content has to sound robotic. Remember, you’re writing for human readers — people who you want to become customers. Instead of bombarding readers with a sales pitch, focus on creating helpful content that addresses their pain points and helps them solve problems. It’s also nice to break SEO content into chunks for easy web browsing. Sticking to short, two- to three-sentence paragraphs allows readers to skim your content and pick up on the most important points. You can also use headings (that include target keywords) to break up content. Bonus: Adding videos, images, and graphics to your SEO content can boost your rankings and engage site visitors. When it comes to content length, there’s not a magic formula. Some SEOs claim that longer content ranks higher in search results, but that’s not always the case. If you want to earn top rankings with your SEO writing, focus on quality vs. quantity. Search engines rank in-depth, comprehensive content that provides value to readers. Covering a topic in-depth naturally results in longer content, so it makes sense that longer posts get associated with higher rankings. At the same time, it’s possible to rank at the top of the SERPs with very little content — if that content matches search intent and provides quality information. When it comes to writing for SEO, we like to aim for 1000 – 2000 words, depending on the topic. Keep in mind, though, that range is a guide, not a guaranteed recipe for SEO copy success. Some topics work better as 1000-word blog posts, while others require 2000+ words to fully cover the topic. Google looks at the number and quality of your site’s backlinks when ranking content. When credible sites link to content on your website, it makes your site appear more authoritative — and search engines will rank your content higher in SERPs. The relationship between social shares and site rankings is a bit cloudier. While social media isn’t a direct SEO ranking factor, social shares can definitely increase buzz (and links!). Plus, social posts send valuable traffic back to your website. That said, it’s important to write SEO content that’s easy to share online. You can do this by including social sharing buttons and CTAs that encourage people to like and share your content. If people like what they see, they may also link back to your site, boosting your SEO cred. Speaking of links, you’ll also want to consider internal links when writing SEO content. Adding links to relevant content on your site helps visitors locate content on your website that matches their search intent, answers their questions, and helps them learn more about your business. Internal linking is a crucial component of your site’s structure and navigation, but it’s also essential for SEO. Linking to new content on your site from existing posts makes it easier for search bots to crawl and discover your new content. Making it easier for search engines to index your content increases your chances of snagging a top search result spot. So, next time you sit down to write for SEO, think about how internal links help both readers and search bots navigate and discover your site’s content. You want to write SEO content that performs well in search results and adds value to readers. But if visitors make it to the end of a page or blog post and don’t know what to do next, you didn’t accomplish your mission. When writing SEO content, include clear, creative CTAs that tell readers what to do next. Want them to download a guide? Subscribe to your email list? Purchase a product? You need to tell them! Make sure your CTAs pop on your site, and write them in a way that conveys the value people will get when they click. You can write valuable content that ranks at the top of search results, but if people don’t convert, it won’t do your business much good. CTAs help you seal the deal and drive conversions with your SEO content. Finally, don’t forget to monitor your site’s analytics and content performance. Tools like Google Analytics make it easy to monitor key performance indicators (KPIs), like most-visited and top-converting content. If you notice a particular type of content or topic performing exceptionally well for your business, you can tweak your strategy to write similar SEO content. It’s also important to update your content regularly. Search engines and readers love fresh content, and optimizing your site with insights from your analytics will help you write content that not only ranks at the top of search results, but also converts high-value leads into loyal customers. Need help writing SEO copy that converts? WebFX offers custom SEO and content marketing plans to help you rank at the top of search results, engage site visitors, and earn more conversions. Our SEO copywriters have years of experience writing compelling copy for clients in a number of industries. In fact, our SEO copy has helped clients generate more than $1.5 billion in revenue in the past five years. Contact us today to learn more or give us a call at 888-601-5359. Emily is a Web Marketing Analyst, certified in Google Analytics. She specializes in content and email marketing and is finishing the last semester of her digital marketing M.S. program. In her free time, she enjoys hiking, road trips, and drinking strong coffee. Follow her on Twitter @emcarter16.